RJ12 6 Conductor. 26 AWG. Color options: Silver Satin or Black jacket. UL listed. Length: 1000 ft.
Modular Bulk Cables are required to facilitate long telephone connections within and across vicinity. You can get it delivered at your doorsteps now. 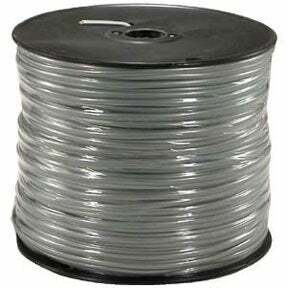 In this category we have 1000 ft RJ11 6P4C 28 AWG modular telephone cable, RJ12 26 AWG modular telephone cable, RJ12 6P4C 28 AWG modular telephone cable, RJ45 8 conductor 26 AWG Silver satin jacket , 8 conductor 28AWG Silver satin jacket, etc. We only source products from ISO 9001-2000 registered industries, which justifies the quality and safety of our products. The products are environment friendly and are applicable for lifetime technical support.